SlikStik, makers of ultra-cool gaming gear, have come out with another neat new knob: a small rubber-ringed wonder that is just great for Tempest play. This knob will be available shortly on their web site, and is in addition to their recent "Duo-Tone" knob, and my personal favorite, the skirted aluminum knob. All of these knobs are available in several anodized colors. MameBench is an easy to use tool for automating benchmarks without messing up your existing configs. It creates result both with and without D3D. After it completes, look in the BENCHMARK directory for the output. The benchmark is based on a simpler routine at the MAME32 site. Note: Apparently there is a bug in the current version of the batch file when it's run under Win2000/XP. Chris has found a fix, and should have the updated version online tonight. Keep Getting 404 Errors on RetroBlast? If you keep getting a 404 error when visiting RetroBlast, you may need to update your bookmark. When I added polls to the front page of the site, it required changing some filenames. If you bookmarked the front page of RetroBlast before 4/14/04, you probably should bookmark it again. 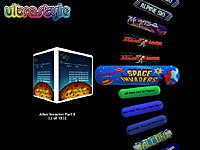 Best to just bookmark "http://www.retroblast.com/"
If you've visited the "Build Your Own Arcade Controls" (BYOAC) forums, odds are that you've found them to be a well-spring of knowledge about arcade cabs and everything associated with them. Well, John St. Clair ("Saint"), the "proprietor" of the BYOAC FAQ, has complied all of that great cabinet-building knowledge into a book entitled, "Project Arcade: Build Your Own Arcade Machine," published by Wiley and Sons. The project even has its own BYOAC message board if you'd like more details and excerpts. The book is due to be published soon, and can even be pre-ordered from Amazon.com. Very cool, and congrats to John! Need to Fix a Pinball Machine? It's always great when someone gives back to a hobby. In this case, giving back is an understatement: I'm talking about the massive pinball repair guides that can be found on the "Marvin's Marvelous Mechanical Museum" web site. These guides, compliments of the hard work of Clay Harrell, cover nearly every type of pinball machine ever made — we are talking about volumes and volumes of detailed troubleshooting repair information! These guides have already been invaluable to me, and I've only owned a pinball machine for a few months! Highly, highly recommended for any pinball owner. I've just spent some quality time over the last few days with a new MAME front end: UltraStyle, by Chris Conchelos. Inspired by the Ultracade interface, Ultrastyle features a very cool "rotating" games list (that can even be controlled via a trackball or spinner — very nice!). I love the rotating screenshot, and the use of marquees for the game titles. It's even skinnable! This is a very nice front end, and Chris continues to improve it with each release (which he cranks out quite regularly!). Be sure and check it out! I take a look at two different Smart Strips, each with a different function: the LCG4 "Next Generation" Smart Strip, and the LBG1 "Browout Protection" Smart Strip. Which do you want in your cab? Check out the review for full details. Getting "Out of Range" Errors on Your Arcade Monitor? I've had a few emails recently asking about how to prevent "Out of Range" display errors when running MAME on a system using an arcade monitor. The problem stems from the fact that an arcade monitor (even the very spiffy WG D9200) does not report its characteristics to the PC in the same way that a traditional PC monitor does, so Windows has no idea what the maximum supported refresh rate is, and quite often accidently goes "over the line," especially in vector games (which often try to use a resolution higher than the monitor can support). How to fix this problem? If you're using Win98, get the handy HZ Tool, or if you're using Win2000 or XP, get RefreshForce. Both of these programs allow you to add or delete resolutions from Windows, as well as force a maximum refresh rate for each supported resolution. Find out what the maximum workable resolution is for your monitor is (for example, the D9200 supports an official max of 640x480x60hz, but can be run at 800x600x60hz), then run one of these programs and remove anything higher than that. Presto, your "out of range" errors will be history. 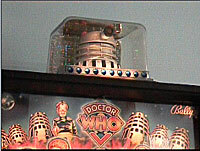 I realize this may only be of interest to a few, but here's a short video snippet showing the Dalek Wobble Head installed and working on my "Doctor Who" pinball machine. I just updated (12pm EST) this week's poll question, "Do you plan on building a MAME arcade cabinet," since I realized had I left out anyone who had already built or bought a cab! If you've already voted, the totals were cleared, so you'll need to vote again. Well, since it has taken me forever and a day so far to get the joystick review done, I'm going to go ahead and post two very important tidbits of the review to hold you over until it's done: the best and worst joysticks, as I currently see things. Best Joystick? The Happs Perfect360 Optical joysticks. 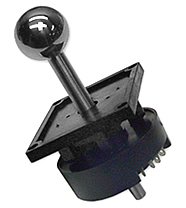 This joystick is a joy (hah, pun) to play with, with not a microswitch "click" anywhere and great diagonals. It's got a solid feel, great response, and when paired with the SlikStik steel joystick handles (I'm personally a big fan of the ball-top version) is absolutely amazing. This one's on top by a huge margin. Worst Joystick? The Happs Top-Fire joystick. It's just plain uncomfortable to use, and while I can appreciate the need for a fire button on a joystick, there's just got to be a better shape for the handle. Now here's something neat — a customizable control panel tester, compliments of Dr. Romz. Think of it as the steroid-enhanced version of the "Keyhook" program I recently uploaded to the File Downloads page. If you want to verify that all your control panel buttons, knobs, and joysticks are working, this is definitely worth looking into. A new version of MARRT (MAME Adult ROMs Removal Tool) has been released. MARRT uses the "mature.ini" file from Triggerfin's excellent Catlist site to delete or move all adult games from your MAME installation. Yes, I always extract the mame source to c:\mingw\mame. You then copy the patches into c:\mingw\mame as well. SRC should be a subfolder of c:\mingw\mame. Then run patch.bat and it should say each one is ok and prompt you to apply. Once everything's patched the way you want, all you need to do is complie a new MAME executable according to the directions on MAME.net, and presto! Lots of cool new features. If you've never compiled a version of MAME before, don't let it intimidate you — follow the instructions to the letter, and it's actually very simple. I've begun work on the SmartStrip2 review. It shouldn't take long (it's a powerstrip, remember? ), but I do have some questions that I'm getting answered from Bits Limited for the review. Look for the review in a couple of days. Did You Miss Part 2? I just did a quick check of the site stats, and discovered that while over a thousand people had already read the first page of the Devastator II review, only about 350 of you had managed to move on to the second page. Now either I overwhelmed you with too much detail (or bad writing), or my "Next" button was just too small to notice. If you missed page 2 of the review and want to read it, Click Here for the exciting conclusion to the Devastator II saga! New .81 Cheats File for MAME! The RetroBlast review of the Devastator II controller by Treyonics is now up and ready for your reading pleasure over on the Product Reviews page. It's a full-sized, full-featured controller, with a trackball, spinner, pinball buttons, and more. So, how does the Devastator II stack up to the competition, and is it worth a look when you're shopping for a MAME arcade controller? Go and check out the review for full details. ArcadeVGA / WGD9200 / Light Gun Conflict Mystery Solved! P1279201 Video/Sync input board for the D9200. The older Rev. B version did not work with the Act-Lab light gun but the newer Rev. D version is fine. Wells-Gardner tech support are aware of this issue. The boards can be upgraded but there are many components to change. I expect W-G would be able to do some kind of swap-out, but I would not think, or expect, them to do it without charge, as it's not really a defect in the design but a compatibility issue. While a board swap may not be a cheap solution (I haven't checked with Wells Gardner yet), at least there is now hope for the light-gun impaired D9200 owner. I've updated the ACT-Labs Light Gun review and the Light Gun Shootout with this news. Let the Epic Video Reviews Begin Shooting! Allow me a bit of gadget-lust here, as I admire my newest acquisition: A SLIK 300DX tripod. I've been frustrated at how difficult it's been to pan and tilt with my current cheap tripod, and I finally decided that I needed to invest in a really good tripod. I'm tweaking and fixing things again, so if something on the site breaks, let me know. Oh, and if you've got a must-see arcade-related site you want me to add to the links page, please let me know (I just added David Butler's new MAMEWAH Setup site, and more sites are coming). Several of you have been bugging me for quite a while for some new videos, so go to the video reviews page and stop slobbering, already! I just got an order from SuperBrightLEDs today (told you it was a day of pleasant surprises). In addition to some 4-led red lamps that I ordered for the MAMEframe2's coin door lights (How-To and Review), I also got this funky device. What is it? I'm not telling yet — I've got a cool mod I'm going to try out, and if it works, I'll post full details. If it doesn't, well, you never read this. David Butler emailed me to let me know that the homepage for his great MAMEWAH Setup Utility has moved, to www.mamewah-setup.co.uk. If you're using MAMEWAH, be sure to check out David's setup utility, as it makes getting multiple emulators configured a cinch. You can download it from the RetroBlast File Downloads. I got the opportunity today to play-test the Devastator II from Treyonics, thanks to a special delivery by one of the owners of Treyonics, Jim Krych. It's an impressive controller, and it was nice to "talk shop" about arcade controllers. Don't worry, I took lots of photographs and video, so look for a full-featured review of the Devastator II as soon as I can get everything processed and written up. A special thanks to Jim Krych for taking the time to visit and show off his great arcade controller! I realize the audience for this product may be small, but if you own a Williams or Bally pinball machine made between 1991 and 1995, the Pinball Inc. DMD-HVP (Dot Matrix Display - High Voltage Power) board is a lifesaver, and can even prevent costly repairs to your machine's display controller circuitry. I know it did great things for my pinball machine's dot matrix display! Check out the review for full details. How Do You Feel About Polls? I've just added polling features to the site, and will have a weekly poll on the front page of RetroBlast. This week's question: Did you build or buy your arcade controller? A Must For Tempest and Gyruss Fans! It's got a great retro-techno soundtrack, powerups, bosses, cheats, hidden levels, and a lot more. I bought this one within minutes of trying it out (and no, I couldn't even wait long enough to email them and ask if I could get a review copy!) A special thanks to "escaped turkey" for emailing me about it! The good news is that I have a new review up on RetroBlast! The bad news? It isn't the joystick roundup yet, and I'm not going to even try and guesstimate a date for that review, since the review gods have dealt with me harshly every time I've optimistically announced the joystick roundup's imminent arrival. If I want to stay alive, I'd best not offer up much more than "I'm working on it." Anyway, the new review is of Ken Iman's Mirror-Glazed Pinballs, an uber-shiny way to add some serious sparkle to a pinball machine (and perhaps even improve the gameplay). More reviews are coming shortly — think of them as 'warm-ups' to the main event. I've gotten a couple of questions this last month asking how my SlikStik Arcade Cab was holding up, particularly the cam-lock system used to hold it all together. I'm happy to report that it is still rock-solid, even though I've spun it around many, many times to tweak or adjust something on the PC inside the cabinet. Not a creak or squeak anywhere, and I've got to admit I had my concerns, which now seem to be completely unfounded. The whole things still feels like a solid piece of equipment, despite the fact that it can be easily disassembled in minutes. I've updated the cabinet review with my positive results. Hats off to some really great design work by SlikStik! Well, be sure and check out Armagetron.This is the original Tron cycle game on steroids — there are almost too many options to list, but some of the highlights include multiple split screen views, AI or human opponents, team play, Internet play, and a lot more. This is a great game for MAME cabs, due to the simple (and customizable) controls, and great performance even on lower-powered 3D cards. Versions are available for multple OS's, everything from Windows to Mac to Linux. 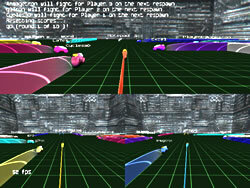 Nearly everything can be tweaked, from the screen display to auto-team balancing and AI skills. The best part? It's a GPL free game! Go to the Armagetron page on Sourceforge for all the details. Thanks to Jim Malik for pointing out this great game! Looking to improve your pinball game? Do you feel like you're still just flailing at the flipper buttons and hoping that the ball goes somewhere? Check out "Playing the Game of Pinball" over at the Pinball Pasture, a great collection of tutorials and tips on how to "play the silver ball." The guide even includes some animations to help you visualize what you need to do to rack up those really big scores. I consider myself a fairly good player, but I still picked up some great moves that I had never even thought to try. One of the smartest purchases I made for the MAMEframe2 was (appropriately enough) the SmartStrip from Bits Limited. Setting up a "single-switch" power solution for a cab with a PC, marquee light, and sound system just doesn't get any easier. I checked out the Bits Limited web site recently, and was surprised to see a number of new products, including versions of the SmartStrip with brownout protection and time-delayed outlets. Expect some new power strip reviews soon. Having trouble tracking everything? Try MAMElog! I got a very nice email today from Santiago Rodriguez about his new site MAMElog. What's cool about this site is that he's tracking all the releases of...well, practically everything MAME related: MAME versions, support files, ROMs, artwork, frontends...you name it. This is a great resource for a quick "one-stop" checkup to make sure your MAME setup is fully up-to-date. Thanks, Santiago! Want to Add a PS/2 or X-Box to Your MAME Cab? Checkout the AVerMedia TVBox 5, an external video "breakout box" with VGA passthrough that includes a TV tuner and remote. It looks like just the thing for adding TV and console gaming to your MAME cab. There are two versions, the TVBox 5 (with XGA 1024x768 resolution) and the TVBox 9 (with SXGA 1280x1024 resolution). For an arcade monitor, you'll be hard pressed to even use the TVBox 5's max resolution, but for only $70, it looks like a cheap and easy way to expand your MAME cab's capabilities. If you've got a front end that supports startup movies (or you just dig cool MAME-related animation), be sure to check out the CinemArcade site. They've got some great MAME animations — be sure to check out the Arcade '84 movie...if it doesn't bring a tear to your eye, you're not a die-hard arcade gamer! If you're building a cab and are having trouble choosing between a PC monitor, a television, or an arcade monitor, there's a nice page over on Arcade Paradise that compares the three display devices, and their appropriateness for MAME use. Yes, I'm still making minor changes to the site, so once again, if a link is broken, let me know. Thanks!